My name is Philip Clift and I am the owner of Petite Anse Hotel in Grenada . I'm inviting you to sponsor me as I run the 26.2 miles of the London Marathon. You will be helping me to raise £5000 for the prosthetic sourcing and fitting organisation of Attach-A-Leg in Grenada . Having personally witnessed the transformation that can result from the organisation's work in the community, I want to give them a financial donation, so they can go on to do more good works. The husband of one of our staff had his leg amputated as a result of diabetes. He became very down and depressed and felt that his life had come to an end. He didn't leave the house and just couldn't see a future for himself. Attach-A-Leg in Grenada took him on and after a few fittings, he came to us at Petite Anse Hotel for his final fitting with Gylfi from the organisation. Our man arrived at the hotel on crutches - went through what can only be described as a transformation and walked out on his new leg. It was very moving and an opportunity to witness what a huge difference this organisation can make to the lives of people in Grenada. The gentleman is now back to driving, working on his land and has returned to a life that is fulfilling and satisfying for him. We've even heard reports that he is running! Attach-A-Leg is a non-profit organisation that helps amputees in Grenada to regain their lives after surgery. Their approach is to provide a high-quality service but to be cost-efficient. Grenada has many amputees as there is a high rate of diabetes per capita. 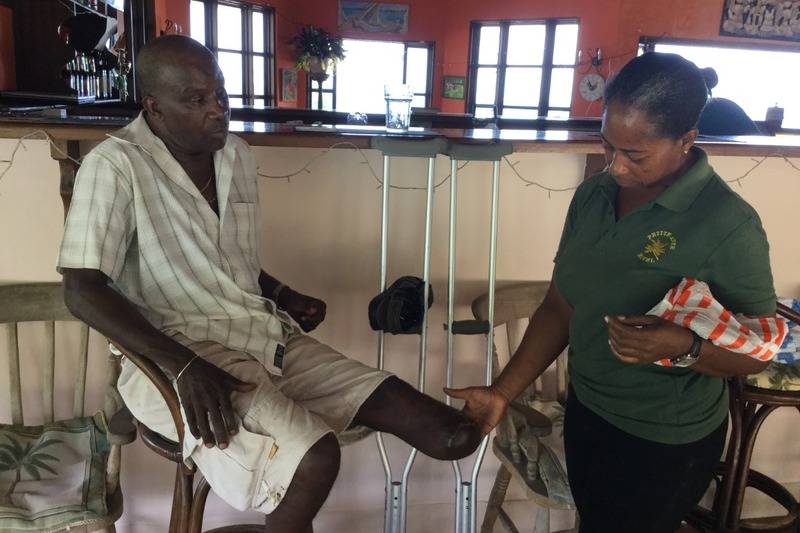 Attach-A-Leg works with the Grenada Council for the Disabled and the Grenada General Hospital in St Georges. 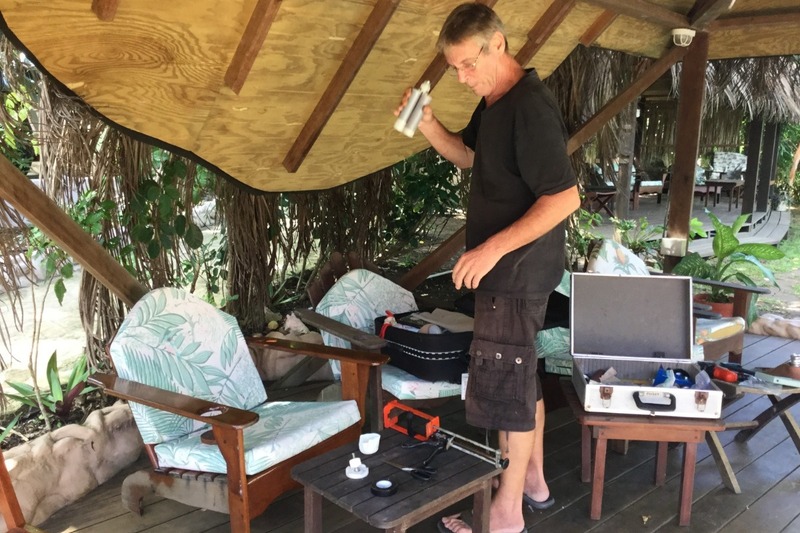 Here is Gylfi from Attach-A-Leg with some of his prosthetic fitting equipment at Petite Anse Hotel in 2016. I am running the London Marathon to raise £5000 so that Attach-A-Leg can go on to help others return to their lives in full. Thank you and please give as every penny counts. You may recall that I ran the London Marathon in 2016 to replace the roof of the local Hilarion Home. The home is close to us here in Sauteurs, St Patricks, Grenada. You helped me to do it. I've thanked you before, and I am thanking you again. You helped me to raise over £25,000 and the home has their new roof. 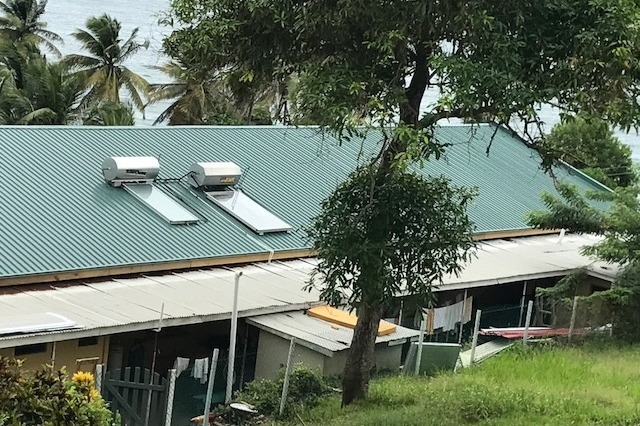 The residents who are elderly and/or disabled now feel confident that should bad weather come to the island, the roof is very likely to stay covering them to keep them safe. Please join me in making a difference through giving to another very worthy cause. I'll do the running and if you could do the donating, we'll be in good shape to give Attach-A-Leg a helping hand. 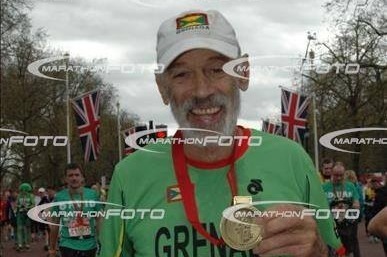 Here I am having completed the London Marathon raising Donations for the Hilarion Home's new roof. Here is the new roof of the Hilarion Home. Thank you to everybody who has donated so far, we are 10% of the way to being able to give a generous donation to Attach-a-Leg Grenada. They will soon be in a better position to help the amputees of Grenada. Do know that I'm training hard and really feeling it!!! !